"Repeat after me: Don't scramble your eggs, scramble your tofu! This splendid breakfast dish is one of my all-time favorite ways to eat tofu. Oh, what's that? You hate tofu? This is the dish that has converted all of my tofu-skeptic friends. 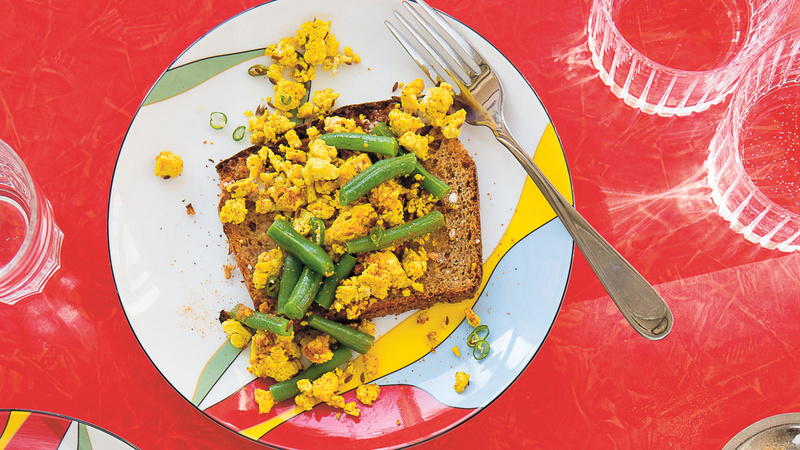 It's based on a classic Northern Indianbreakfast my dad remembers from his childhood, originally involving crumbled paneer sauteed with spices and green beans and usually eaten atop toast. In a large skillet over medium heat, warm the oil. Once the oil begins to shimmer, add the cumin seeds and cook until they turn a medium shade of brown, about 1 minute max. Swirl the turmeric into the oil, then add the green beans, salt, and chilli. Reduce the heat to low, cover, and cook for 5 to 7 minutes, until the green beans are just barely soft (they should still retain a bit of firmness). Add the crumbled tofu and mix well, then increase the heat to medium and cook, uncovered, for 3 to 4 minutes, until the tofu has softened slightly and turned bright yellow from the turmeric. Remove the skillet from the heat and mix in the lime juice and chaat masala.Taste and adjust the lime juice, chaat masala, and salt before serving, if needed.